The Empire State Building is a 103-story skyscraper located in Midtown Manhattan, New York City, at the intersection of Fifth Avenue and West 34th Street. It has a roof height of 1,250 feet (381 meters), and with its antenna spire included, it stands a total of 1,454 feet (443.2 m) high. Its name is derived from the nickname for New York, the Empire State. It stood as the world’s tallest building for nearly 40 years, from its completion in early 1931 until the topping out of the World Trade Center’s North Tower in late 1970. Following the September 11 attacks in 2001, the Empire State Building was again the tallest building in New York (although it was no longer the tallest in the U.S. or the world), until One World Trade Center reached a greater height on April 30, 2012. The Empire State Building is currently the fourth-tallest completed skyscraper in the United States (after the One World Trade Center, the Willis Tower and Trump International Hotel and Tower, both in Chicago), and the 23rd-tallest in the world (the tallest now is Burj Khalifa, located in Dubai). It is also the fourth-tallest freestanding structure in the Americas. The Empire State Building is generally thought of as an American cultural icon. It is designed in the distinctive Art Deco style and has been named as one of the Seven Wonders of the Modern World by the American Society of Civil Engineers. The building and its street floor interior are designated landmarks of the New York City Landmarks Preservation Commission, and confirmed by the New York City Board of Estimate. It was designated as a National Historic Landmark in 1986. In 2007, it was ranked number one on the List of America’ Favorite Architecture according to the AIA. The building is owned by the 2,800 investors in Empire State Building Associates LLC. In 2010, the Empire State Building underwent a $550 million renovation, with $120 million spent to transform the building into a more energy efficient and eco-friendly structure. Receiving a gold Leadership in Energy and Environmental Design (LEED) rating in September 2011, the Empire State Building is the tallest LEED certi\fied building in the United States. The limestone for the Empire State Building came from the Empire Mill in Sanders, Indiana which is an unincorporated town adjacent to Bloomington, Indiana. The Empire Mill Land office is near State Road 37 and Old State Road 37 just south of Bloomington. Bloomington, Bedford and Oolitic area are known as the limestone capital of the world. It is a point of local pride that the stone for the Empire State building came from there. The Empire State Building was designed by William F. Lamb from the architectural firm Shreve, Lamb and Harmon, which produced the building drawings in just two weeks, using its earlier designs for the Reynolds Building in Winston-Salem, North Carolina, and the Carew Tower in Cincinnati, Ohio (designed by the architectural firm W. W. Ahlschlager & Associates) as a basis. Every year the staff of the Empire State Building sends a Father’s Day card to the staff at the Reynolds Building in Winston-Salem to pay homage to its role as predecessor to the Empire State Building. The building was designed from the top down. The general contractors were The Starrett Brothers and Eken, and the project was financed primarily by John J. Raskob and Pierre S. du Pont. The construction company was chaired by Alfred E. Smith, a former Governor of New York and James Farley’s General Builders Supply Corporation supplied the building materials. John W. Bowser was project construction superintendent. Excavation of the site began on January 22, 1930, and construction on the building itself started symbolically on March 17—St. 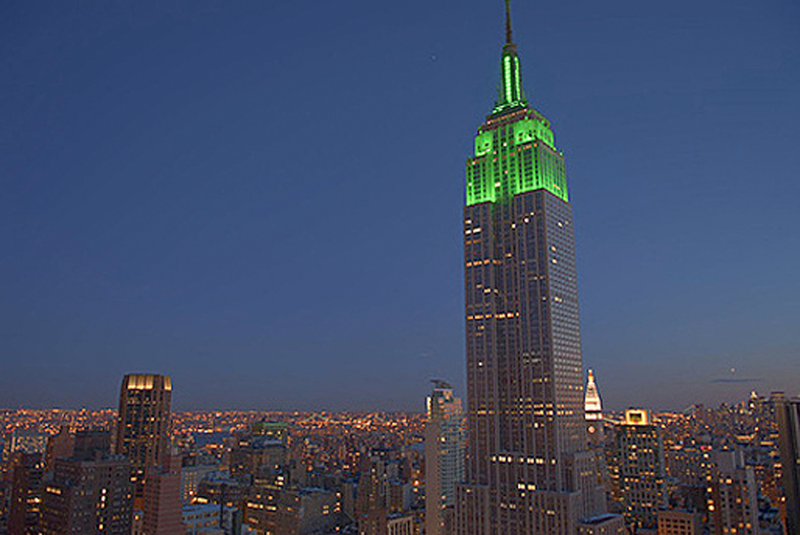 Patrick’s Day—per Al Smith’s influence as Empire State, Inc. president. This was about the time that the Great Depression started. The project involved 3,400 workers, mostly immigrants from Europe, along with hundreds of Mohawk iron workers, many from the Kahnawake reserve near Montreal. According to official accounts, five workers died during the construction. Governor Smith’s grandchildren cut the ribbon on May 1, 1931. Lewis Wickes Hine’s photography of the construction provides not only invaluable documentation of the construction, but also a glimpse into common day life of workers in that era. The construction was part of an intense competition in New York for the title of “world’s tallest building“. 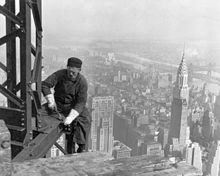 Two other projects fighting for the title, 40 Wall Street and the Chrysler Building, were still under construction when work began on the Empire State Building. Each held the title for less than a year, as the Empire State Building surpassed them upon its completion, just 410 days after construction commenced. Instead of taking 18 months as anticipated, the construction took just under fifteen. The building was officially opened on May 1, 1931 in dramatic fashion, when United States President Herbert Hoover turned on the building’s lights with the push of a button from Washington, D.C. Coincidentally, the first use of tower lights atop the Empire State Building, the following year, was for the purpose of signaling the victory of Franklin D. Roosevelt over Hoover in the presidential election of November 1932. The building’s opening coincided with the Great Depression in the United States, and as a result much of its office space was initially unrented. The building’s vacancy was exacerbated by its poor location on 34th Street, which placed it relatively far from public transportation, as Grand Central Terminal and Penn Station were (and are) several blocks away, as is the more-recently built Port Authority Bus Terminal. Other more successful skyscrapers, such as the Chrysler Building, did not have this problem. In its first year of operation, the observation deck took in approximately 2 million dollars, as much money as its owners made in rent that year. The lack of renters led New Yorkers to deride the building as the “Empty State Building”. The building would not become profitable until 1950. 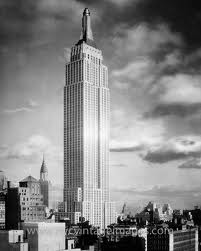 The famous 1951 sale of The Empire State Building to Roger L. Stevens and his business partners was brokered by the prominent upper Manhattan real-estate firm Charles F. Noyes & Company for a record $51 million. At the time, that was the highest price paid for a single structure in real-estate history. At 9:40 am on Saturday, July 28, 1945, a B-25 Mitchell bomber, piloted in thick fog by Lieutenant Colonel William Franklin Smith, Jr., crashed into the north side of the Empire State Building, between the 79th and 80th floors, where the offices of the National Catholic Welfare Council were located. One engine shot through the side opposite the impact and flew as far as the next block, where it landed on the roof of a nearby building, starting a fire that destroyed a penthouse. The other engine and part of the landing gear plummeted down an elevator shaft. The resulting fire was extinguished in 40 minutes. Fourteen people were killed in the accident. Elevator operator Betty Lou Oliver survived a plunge of 75 stories inside an elevator, which still stands as the Guinness World Record for the longest survived elevator fall recorded. Despite the damage and loss of life, the building was open for business on many floors on the following Monday. The crash helped spur the passage of the long-pending Federal Tort Claims Act of 1946, as well as the insertion of retroactive provisions into the law, allowing people to sue the government for the accident. A year later, another aircraft narrowly missed striking the building. Over the years, more than thirty people have attempted suicide, most successfully, by jumping from the upper parts of the building. The first suicide occurred even before its completion, by a worker who had been laid off. The fence around the observatory terrace was put up in 1947 after five people tried to jump during a three-week span. 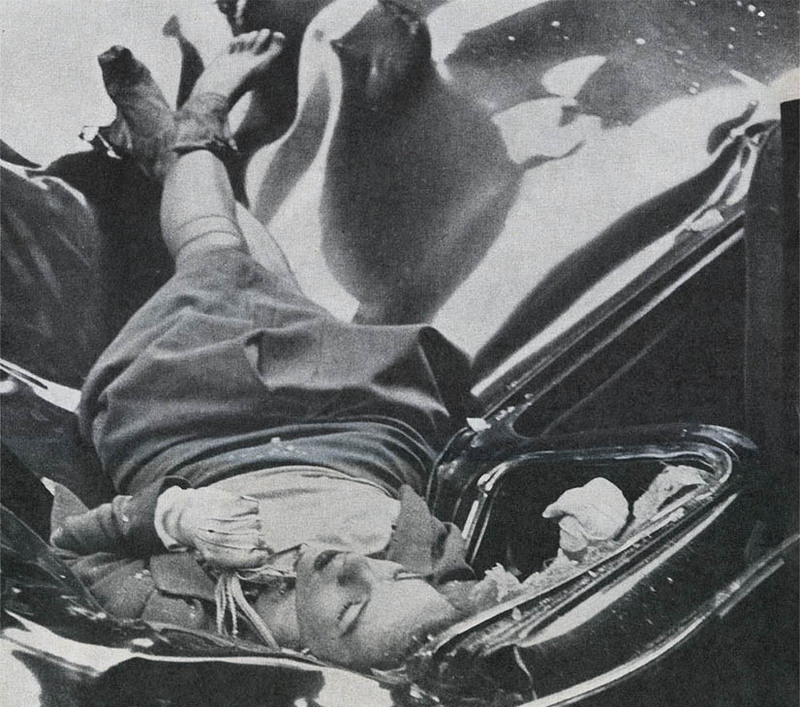 On May 1, 1947, 23-year-old Evelyn McHale leapt to her death from the 86th floor observation deck and landed on a limousine parked at the curb. Photography student Robert Wiles took a photo of McHale’s oddly intact corpse a few minutes after her death. The police found a suicide note among possessions she left on the observation deck: “He is much better off without me … I wouldn’t make a good wife for anybody”. The photo ran in the May 12, 1947 edition of Life magazine, and is often referred to as “The Most Beautiful Suicide”. It was later used by visual artist Andy Warhol in one of his prints entitled Suicide (Fallen Body). In December 1943, ex-United States Navy gunner’s mate William Lloyd Rambo jumped to his death, landing amidst Christmas shoppers on the street below. Only one person has jumped from the upper observatory: on November 3, 1932, Frederick Eckert, of Astoria, ran past a guard in the enclosed 102nd floor gallery and jumped a gate leading to an outdoor catwalk intended for dirigible passengers. Eckert’s body landed on the roof of the 86th floor observation promenade. Two people have survived jumps, in both cases by not managing to fall more than a floor: On December 2, 1979, Elvita Adams jumped from the 86th floor, only to be blown back onto the 85th floor by a gust of wind and left with a broken hip. On April 25, 2013, a man, who is presumed to have jumped, fell from the 86th floor observation deck but landed alive on an 85th floor ledge – where security guards managed to bring him inside; he suffered only minor injuries. Two major shooting incidents have occurred at or in front of the Empire State Building. On February 24, 1997, a gunman shot seven people on the observation deck, killing one, then fatally wounded himself. On August 24, 2012 at about 9 am EDT, on the sidewalk at the Fifth Avenue side of the building, a gunman shot and killed a former co-worker from a workplace that had laid him off in 2011. When two police officers confronted the gunman, 58-year-old Jeffrey T. Johnson, he aimed his firearm at them. They responded by firing 16 shots at Johnson, killing him but also wounding nine bystanders, most of whom were hit by fragments, although three took direct hits from stray bullets. The Empire State Building is seen across the East River from Brooklyn. A series of setbacks causes the building to taper with height. The Empire State Building rises to 1,250 ft (381 m) at the 102nd floor, and including the 203 ft (62 m) pinnacle, its full height reaches 1,453 ft–89⁄16 in (443.09 m). The building has 85 stories of commercial and office space representing 2,158,000 sq ft (200,500 m2). It has an indoor and outdoor observation deck on the 86th floor. The remaining 16 stories represent the Art Deco tower, which is capped by a 102nd-floor observatory. Atop the tower is the 203 ft (62 m) pinnacle, much of which is covered by broadcast antennas, with a lightning rod at the very top. The Empire State Building was the first building to have more than 100 floors. It has 6,500 windows and 73 elevators, and there are 1,860 steps from street level to the 102nd floor. It has a total floor area of 2,768,591 sq ft (257,211 m2); the base of the Empire State Building is about 2 acres (8,094 m2). The building houses 1,000 businesses and has its own zip code, 10118. As of 2007, approximately 21,000 employees work in the building each day, making the Empire State Building the second-largest single office complex in America, after the Pentagon. The building was completed in one year and 45 days. Its original 64 elevators are located in a central core;today, the Empire State Building has 73 elevators in all, including service elevators. It takes less than one minute by elevator to get to the 80th floor, which contains a gift shop and an exhibit detailing the building’s construction. From there, visitors can take another elevator or climb the stairs to the 86th floor, where an outdoor observation deck is located. The building has 70 mi (113 km)of pipe, 2,500,000 ft (760,000 m) of electrical wire, and about 9,000 faucets. It is heated by low-pressure steam; despite its height, the building only requires between 2 and 3 psi (14 and 21 kPa) of steam pressure for heating. It weighs approximately 370,000 short tons (340,000 t). The exterior of the building was built using Indiana limestone panels. The Empire State Building cost $40,948,900 to build (equal to roughly $500,000,000 in 2010). Long-term forecasting of the life cycle of the structure was implemented at the design phase to ensure that the building’s future intended uses were not restricted by the requirements of previous generations. This is particularly evident in the over-design of the building’s electrical system. Unlike most of today’s skyscrapers, the Empire State Building features an art deco design, typical of pre–World War II architecture in New York. The modernistic stainless steel canopies of the entrances on 33rd and 34th Streets lead to two story-high corridors around the elevator core, crossed by stainless steel and glass-enclosed bridges at the second-floor level. The elevator core contains 67 elevators. The lobby is three stories high and features an aluminum relief of the skyscraper without the antenna, which was not added to the spire until 1952. The north corridor contained eight illuminated panels, created by Roy Sparkia and Renée Nemorov in 1963 in time for the 1964 World’s Fair, which depicts the building as the Eighth Wonder of the World, alongside the traditional seven. These panels were eventually moved near a ticketing line for the observation deck. The building’s lobbies and common areas received a $550 million renovation in 2009, which included new air conditioning, waterproofing, and renovating the observation deck; moving the gift shop to the 80th floor. Up until the 1960s, the ceilings in the lobby had a shiny art deco mural inspired by both the sky and the Machine Age, until it was covered with ceiling tiles and fluorescent lighting. Because the original murals, designed by an artist named Leif Neandross, were damaged, reproductions were installed. Over 50 artists and workers used 15,000 square feet of aluminum and 1,300 square feet of 23-carat gold leaf to re-create the mural. Renovations to the lobby alluded to original plans for the building; replacing the clock over the information desk in the Fifth Avenue lobby with an Anemometer, as well as installing two chandeliers originally intended to be part of the building when it first opened. In 2000, the building’s owners installed a series of paintings by the New York artist Kysa Johnson in the concourse level. In January 2014 the artist filed suit in federal court in New York under the Visual Artists Rights Act, alleging the negligent destruction of the paintings and damage to her reputation as an artist. In 1964, floodlights were added to illuminate the top of the building at night, in colors chosen to match seasonal and other events, such as St. Patrick’s Day, Christmas, Independence Day and Bastille Day. After the eightieth birthday and subsequent death of Frank Sinatra, for example, the building was bathed in blue light to represent the singer’s nickname “Ol’ Blue Eyes”. After the death of actress Fay Wray (King Kong) in late 2004, the building stood in complete darkness for 15 minutes. The floodlights bathed the building in red, white, and blue for several months after the destruction of the World Trade Center, then reverted to the standard schedule. On June 4, 2002, the Empire State Building donned purple and gold (the royal colors of Elizabeth II), in thanks for the United Kingdom playing the Star Spangled Banner during the Changing of the Guard at Buckingham Palace on September 12, 2001 (a show of support after the September 11 attacks). This would also be shown after the Westminster Dog Show. Traditionally, in addition to the standard schedule, the building will be lit in the colors of New York’s sports teams on the nights they have home games (orange, blue and white for the New York Knicks, red, white and blue for the New York Rangers, and so on). The first weekend in June finds the building bathed in green light for the Belmont Stakes held in nearby Belmont Park. The building is illuminated in tennis-ball yellow during the US Open tennis tournament in late August and early September. It was twice lit in scarlet to support nearby Rutgers University: once for a football game against the University of Louisville on November 9, 2006, and again on April 3, 2007 when the women’s basketball team played in the national championship game. From June 1 to 3, 2012, the building was lit in blue and white, the colors of the Israeli flag, in honor of the 49th annual Celebrate Israel Parade. During 2012, the building’s metal halide lamps and floodlights were replaced with LED fixtures, increasing the available colors from nine to over 16 million. The computer-controlled system allows the building to be illuminated in ways that were unable to be done previously with plastic gels. For instance, on November 6, 2012, CNN used the top of the Empire State Building as a scoreboard for the 2012 United States presidential election. When incumbent president Barack Obama had reached the 270 electoral votes necessary to win re-election, the lights turned blue. Had Republican challenger Mitt Romney won, the building would have been lit red. Also, on November 26, 2012, the building had its first ever synchronized light show, using music from recording artist Alicia Keys. Those wishing to hear the music could tune to certain radio stations in the New York area. A video of the performance was posted online the next day. In 2013 the lights were changed to Financial Times pink. The building’s distinctive Art Deco spire was originally designed to be a mooring mast and depot for dirigibles. The 103rd floor was originally a landing platform with a dirigible gangplank. A particular elevator, traveling between the 86th and 102nd floors, was supposed to transport passengers after they checked in at the observation deck on the 86th floor.However, the idea proved to be impractical and dangerous after a few attempts with airships, due to the powerful updrafts caused by the size of the building itself, as well as the lack of mooring lines tying the other end of the craft to the ground. A large broadcast tower was added to the top of the spire in 1953. Size comparison in relation to The Pentagon. The Pentagon is 431 metres (1,414 ft) for comparison. The Empire State Building is in light gray. The Empire State Building remained the tallest man-made structure in the world for 23 years before it was surpassed by the Griffin Television Tower Oklahoma (KWTV Mast) in 1954. It was also the tallest free-standing structure in the world for 36 years before it was surpassed by the Ostankino Tower in 1967. 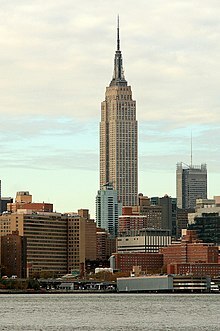 The longest world record held by the Empire State Building was for the tallest skyscraper (to structural height), which it held for 42 years until it was surpassed by the North Tower of the World Trade Center in 1972. An early-1970s proposal to dismantle the spire and replace it with an additional 11 floors, which would have brought the building’s height to 1,494 feet (455 m) and made it once again the world’s tallest at the time, was considered but ultimately rejected. With the destruction of the World Trade Center in the September 11 attacks, the Empire State Building again became the tallest building in New York City, and the second-tallest building in the Americas, surpassed only by the Willis Tower in Chicago. It is currently the fourth-tallest, surpassed by the Willis Tower, the Trump International Hotel and Tower (Chicago) and the One World Trade Center. One World Trade Center, currently under construction, surpassed the roof height of the Empire State Building on April 30, 2012, and became the tallest building in New York City—on the way toward becoming the tallest building in the Americas at a planned 1,776 feet (541 m). When measured by pinnacle height, the Empire State Building is the fourth-tallest building in the USA, surpassed by One World Trade Center, Willis Tower and Chicago’s John Hancock Center. On clear days, the building can be seen from much of the New York Metropolitan Area, as far away as New Haven, Connecticut; Morristown, New Jersey; and from the roller coasters at Six Flags Great Adventure in Jackson Township, New Jersey, specifically Kingda Ka. The Empire State Building has one of the most popular outdoor observatories in the world, having been visited by over 110 million people. The 86th-floor observation deck offers impressive 360-degree views of the city. There is a second observation deck on the 102nd floor that is open to the public. It was closed in 1999, but reopened in November 2005. It is completely enclosed and much smaller than the first one; it may be closed on high-traffic days. Tourists may pay to visit the observation deck on the 86th floor and an additional amount for the 102nd floor. The lines to enter the observation decks, according to Concierge.com, are “as legendary as the building itself:” there are five of them: the sidewalk line, the lobby elevator line, the ticket purchase line, the second elevator line, and the line to get off the elevator and onto the observation deck. For an extra fee tourists can skip to the front of the line. The Empire State Building makes more money from tickets sales for its observation decks that it does from renting office space. The skyscraper’s observation deck plays host to several cinematic, television, and literary classics including, An Affair To Remember, On the Town, Love Affair and Sleepless in Seattle. In the Latin American literary work Empire of Dreams by Giannina Braschi the observation deck is the site of a pastoral revolution; shepherds take over the City of New York. The deck was also the site of a publicity-stunt Martian invasion in an episode of I Love Lucy (“Lucy Is Envious”, season 3, episode 25). On the 102nd floor of the Empire State Building there is a door with stairs ascending up, which leads into the 103rd floor. This was originally built as a disembarkation floor for airships tethered to the buildings spire, and features a circular balcony outside the room as well. It is now a hot spot for when celebrities visit, and an access point to reach the spire for maintenance purposes. The room currently contains electrical equipment, though this was edited out, by camera angle, during the “In the Wind” season-four finale of White Collar. Above the 103rd floor, there is a set of stairs and a ladder to reach the spire for maintenance work only. The Empire State Building also has a motion simulator attraction located on the 2nd floor. Opened in 1994 as a complement to the observation deck, the New York Sky ride (or NY Sky ride) is a simulated aerial tour over the city. The cinematic presentation lasts approximately 25 minutes. Currently (May 2013), tickets are Adults $57, Children $42, Seniors $49. Since its opening, the ride has gone through two incarnations. The original version, which ran from 1994 until around 2002, featured James Doohan, Star Trek’s Scotty, as the airplane’s pilot, who humorously tried to keep the flight under control during a storm, with the tour taking an unexpected route through the subway, Coney Island, and FAO Schwartz, among other places. After the September 11 attacks in 2001, however, the ride was closed, and an updated version debuted in mid-2002 with actor Kevin Bacon as the pilot. The new version of the narration attempted to make the attraction more educational, and included some minor post-9/11 patriotic undertones with retrospective footage of the World Trade Center. The new flight also goes haywire, but this segment is much shorter than in the original. In 2010, the Empire State Building underwent a $550 million renovation, with $120 million spent in an effort to transform the building into a more energy efficient and eco-friendly structure. For example, the 6,500 windows were remanufactured onsite into superwindows which block heat but pass light. Air conditioning operating costs on hot days were reduced and this saved $17 million of the project’s capital cost immediately, partly funding other retrofitting. Receiving a gold Leadership in Energy and Environmental Design (LEED) rating in September 2011, the Empire State Building is the tallest LEED certified building in the United States. New York City is the largest media market in the United States. Since the September 11 attacks, nearly all of the city’s commercial broadcast stations (both television and FM radio) have transmitted from the top of the Empire State Building, although a few FM stations are located at the nearby Condé Nast Building. Most New York City AM stations broadcast from just across the Hudson River in New Jersey. Antennae for broadcast stations are located at the top of the Empire State Building. Broadcasting began at Empire on December 22, 1931, when RCA began transmitting experimental television broadcasts from a small antenna erected atop the spire. They leased the 85th floor and built a laboratory there, and—in 1934—RCA was joined by Edwin Howard Armstrong in a cooperative venture to test his FM system from the Empire antenna. When Armstrong and RCA fell out in 1935 and his FM equipment was removed, the 85th floor became the home of RCA’s New York television operations, first as experimental station W2XBS channel 1, which eventually became (on July 1, 1941) commercial station WNBT, channel 1 (now WNBC-TV channel 4). NBC’s FM station (WEAF-FM, now WQHT) began transmitting from the antenna in 1940. NBC retained exclusive use of the top of Empire until 1950, when the FCC ordered the exclusive deal broken, based on consumer complaints that a common location was necessary for the (now) seven New York television stations to transmit from so that receiving antennas would not have to be constantly adjusted. Construction on a giant tower began. Other television broadcasters then joined RCA at Empire, on the 83rd, 82nd, and 81st floors, frequently bringing sister FM stations along for the ride. Multiple transmissions of TV and FM began from the new tower in 1951. In 1965, a separate set of FM antennas was constructed ringing the 103rd floor observation area. When the World Trade Center was being constructed, it caused serious problems for the television stations, most of which then moved to the World Trade Center as soon as it was completed. This made it possible to renovate the antenna structure and the transmitter facilities for the benefit of the FM stations remaining there, which were soon joined by other FMs and UHF TVs moving in from elsewhere in the metropolitan area. The destruction of the World Trade Center necessitated a great deal of shuffling of antennas and transmitter rooms to accommodate the stations moving back uptown. The Empire State Building anchors an area of Midtown which features other major Manhattan landmarks as well, including Macy’s Herald Square, Koreatown, Penn Station, Madison Square Garden, and the Flower District.Together, these sites contribute to a significant volume of commuter and tourist pedestrian traffic traversing the southern portion of Midtown Manhattan. The Empire State Building Run-Up is a foot race from ground level to the 86th-floor observation deck that has been held annually since 1978. Its participants are referred to both as runners and as climbers, and are often tower running enthusiasts. The race covers a vertical distance of 1,050 feet (320 m) and takes in 1,576 steps. The record time is 9 minutes and 33 seconds, achieved by Australian professional cyclist Paul Crake in 2003, at a climbing rate of 6,593 ft (2,010 m) per hour. The 1939 romantic drama film Love Affair involves a couple who plan to meet atop the Empire State Building, a rendezvous that is prevented by an automobile accident. The film was remade in 1957 (as An Affair to Remember) and in 1994 (again as Love Affair). The 1993 film Sleepless in Seattle, a romantic comedy partially inspired by An Affair to Remember, climaxes with scenes in the Empire State’s lobby and observatory. Andy Warhol‘s 1964 silent film Empire is one continuous, eight-hour shot of the Empire State Building at night, shot in black-and-white. In 2004, the National Film Registry deemed its cultural significance worthy of preservation in the Library of Congress. In the film Percy Jackson & the Olympians: The Lightning Thief, Mount Olympus is located over the Empire State Building, and there is a special elevator in the building to the “600th floor,” which is supposed to be Olympus, just like in the book series. The building is chosen as Ground Zero for the target of a nuclear bomb that is dropped on New York in the film Fail-Safe. Both Zero Mostel and Gene Wilder go to the Observation Deck of the building in the original Mel Brooks film The Producers. In the 2002 film The Time Machine, the Empire State Building is still standing in the year 2030, but dwarfed by several larger skyscrapers around it. It is presumably destroyed by pieces of the moon breaking up and hitting New York in 2037 or it decayed over time, as it is never seen again throughout the rest of the film, which takes place 800,000 years into the future. In the 2004 film Sky Captain and the World of Tomorrow, the top of the building serves its original purpose of being a docking station for dirigibles, and the Hindenburg III docks at it on its maiden voyage. Many films have opened with the Empire State Building, such as West Side Story, Step Up 3D, and The Other Guys. The building has been destroyed in some disaster films, such as Independence Day and Knowing. In the movie The Divide, the building is destroyed by a nuclear bomb detonated on New York. It was heavily featured on posters promoting the film. In the poster for the movie Oblivion, the ruins of the building are seen in the distant future next to a waterfall. Many other movies that feature the Empire State Building are listed on the building’s own website. The Empire State Building featured in the 1966 Doctor Who serial The Chase, in which the TARDIS lands on the roof of the building; The Doctor and his companions leave quite quickly, however, because The Daleks are close behind them. A Dalek is also seen on the roof of the building while it interrogates a human. In 2007, Doctor Who episodes “Daleks in Manhattan” and “Evolution of the Daleks” also featured the building, which the Daleks are constructing to use as a lightning conductor. Russell T Davies said in an article that “in his mind”, the Daleks remembered the building from their last visit. In the science fiction drama series Fringe, the observation deck of the Empire State Building serves its primary purpose as a docking station for zeppelins in the parallel universe shown in the second season episode Peter. The Discovery Channel show MythBusters tested the urban myth which claims that if one drops a penny off the top of the Empire State Building, it could kill someone or put a crater in the pavement. The outcome was that, by the time the penny hits the ground, it is going roughly 65 mph (105 km/h) (terminal velocity for an object of its mass and shape), which is not fast enough to inflict lethal injury or put a crater into the pavement. The urban legend is a joke in the 2003 musical Avenue Q, where a character waiting atop the building for a rendezvous tosses a penny over the side—only to hit her rival. In Gerry Anderson‘s popular puppet series Thunderbirds, the episode Terror in New York City, the Empire State Building is being moved to a new location as the site around it is set for redevelopment. However, something goes wrong and the building collapses, trapping a reporter and his cameraman underneath the rubble. Their rescue is the focus of the rest of the episode. In the Looney Tunes cartoon “Much Ado About Nutting”, a squirrel has so much difficulty opening a coconut, he carries it to the Empire State Building’s observation deck and tosses it over the edge. While the street is damaged by the impact, the coconut remains intact. In the Tom and Jerry cartoon “Mouse in Manhattan,” Jerry walks by and views the Empire State Building, along with other landmarks (the Statue of Atlas at Rockefeller Center and arriving via train at Grand Central Station). The music video of the song “Everything is Everything” (by singer Lauryn Hill) prominently features the Empire State Building as the center of a city (record) turntable. H.G. Wells‘ 1933 science fiction book The Shape of Things to Come, written in the form of a history book published in the far future, includes the following passage: “Up to quite recently Lower New York has been the most old-fashioned city in the world, unique in its gloomy antiquity. The last of the ancient skyscrapers, the Empire State Building, is even now under demolition in C.E. 2106!”. 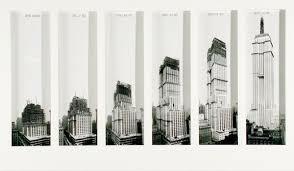 David Macaulay‘s 1980 illustrated book Unbuilding depicts the Empire State Building being purchased by a Middle Eastern billionaire and disassembled piece by piece, to be transported to Saudi Arabia and rebuilt there. The mooring mast is rebuilt in New York, while the remainder of the building is lost at sea. The Empire State Building is featured prominently as both a setting and integral plot device throughout much of Michael Chabon‘s 2000 Pulitzer Prize-winning novel, The Amazing Adventures of Kavalier & Clay. In his “biography”, Doc Savage: His Apocalyptic Life, Philip Jose Farmer theorizes that the skyscraper in which Doc Savage lived and where he met with his comrades, had his laboratories, etc., was the Empire State Building. Since the 86th Floor (mentioned in the Savage stories as his floor) was the Observatory, one may presume that Doc “actually” lived on another floor. In the series, “Percy Jackson & the Olympians“, Rick Riordan shows the Empire State Building as the headquarters of the Olympian Gods, where the Greek Gods live and also hold their meetings. In the children’s novel, James and the Giant Peach, at the end of the book the giant peach is dropped onto the lightning rod of the Empire State Building. In the sci-fi/alternate history series of novels Wild Cards, the 86th floor is the location of New York’s premier chic restaurant, Aces High, a very popular hangout for the superpowered aces. A 7.6 feet (2.3 m) scale model built from 12,000 LEGO bricks over 250 hours is featured along with other notable buildings in the LEGO Architecture: Towering Ambition exhibition at the National Building Museum in Washington, D.C. Soaring more than a quarter of a mile above the heart of Manhattan, the Empire State Building is the World’s Most Famous Office Building. A symbol of dreams and aspirations, the Empire State Building connects with people around the world. A beacon for international and domestic tourists alike, the Empire State Building is a New York City and a National Historic Landmark. Our world-famous 86th and 102nd floor Observatories offer unmatched views of New York City and on a clear day one can see to New Jersey, Connecticut, Massachusetts and Pennsylvania. 1,050 feet above the city’s bustling streets, the 86th floor Observatory offers panoramic views from within a glass-enclosed pavilion and from the surrounding open-air promenade. 200 feet higher, our 102nd floor Observatory is a private and serene perch in the middle of the greatest city in the world. Our Observatories have been a “must visit” for millions each year since it opened to the public in 1931. Each year approximately four million people are whisked to our 86th and 102nd floors, consistently one of New York City’s top tourist attractions. Visit our Observatories 365 days per year, day and night, rain or shine, for magnificent views of Manhattan and beyond. We are open from 8:00 a.m. to 2:00 a.m. The last elevators go up at 1:15 a.m. The Empire State Building embodies the feeling and spirit of New York City. It is recognized not only as an iconic landmark offering some of the most spectacular views on earth, but also as an international symbol of shared hopes, dreams, and accomplishment. Can you correct the list of stations broadcasting from Empire to read “WPIX-11” instead of “WPIX-1” and “WPLJ-95.5” from “WLPJ-95.5”.